Humidity: not something we have to deal with a lot… or much at all… here in Vegas. But call us crazy, Adam and I typically choose to vacation in very humid countries. Earlier this year we were in Thailand where the moisture in the air was almost suffocating, and now we’re on our way to Mexico in a couple weeks that will reportedly be pretty sticky as well. Being someone with thick, textured hair, humidity is typically not my friend. Let’s just say, it doesn’t take much to turn me into Monica in Barbados. So, I’m prepping for this trip by packing my favorite anti-humidity products for thick hair and practicing tips to help manage my hair in the humidity once I’m there. Keep reading for my best defense tactics against humidity for hair. 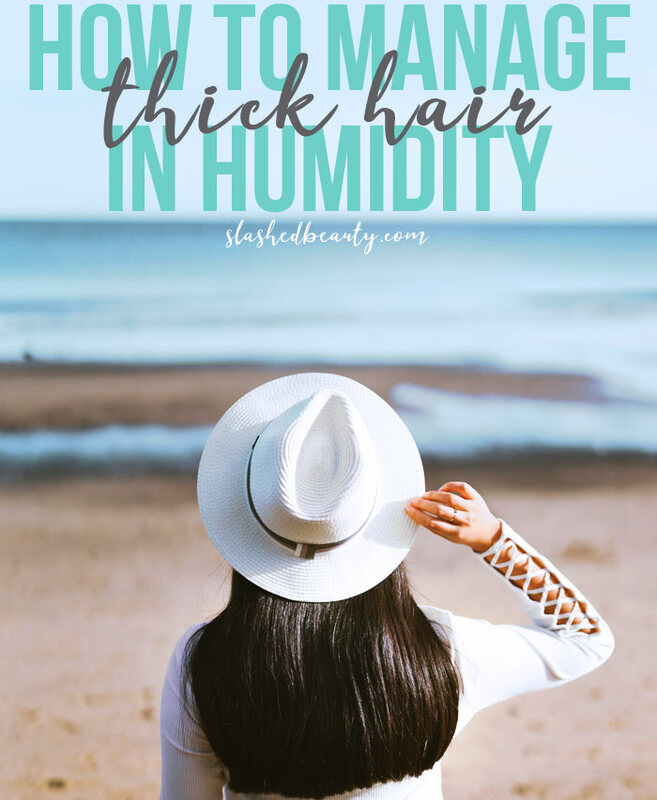 Even though humidity and other vacation activities may cause you to sweat a little more than usual if you’re not used to it, try to limit how much you wash your hair. Over-washing your hair will only make your hair frizzier, as natural oils and moisture get stripped away. Dry shampoo will be your best friend for refreshing in between washes. Try to at least space out washing to every other day, longer if you can stand it. When you do wash your hair, you’ll want to get as much moisture as possible. Use smoothing and hydrating shampoos and conditioners which will help tame split ends and flyaways that will be accentuated in humidity. Rinse your hair at the end of your shower with cold water to help seal the cuticle and reduce frizz. Don’t use a normal towel to dry your hair— the material is typically too rough and will cause frizziness straight out of the gate. Squeeze out as much moisture as you can with your hands, then use a microfiber turban to absorb the rest. Let your hair air dry after applying a styling product. (We’ll get to that below!) Blow drying thick hair usually takes a while, and that heat and movement– and sweat— can cause major frizz. Again, moisture is key here but you’ll also want a little bit of hold to keep the flyaways down. Hair oils and serums are a great way to smooth out your hair and get a boost of hydration at the same time. I’ll apply these right after I step out of the shower while my hair is still damp, avoiding my scalp so that I don’t get a weighed down feel. I will style wet or dry using products specifically marked for anti-humidity and smoothing. I personally prefer anti-humidity sprays since they are more lightweight. Anti-humidity creams, however, spread through thick hair easily and a little usually goes a long way. As a last step, if I need to really keep my hair in place, I’ll use a hair spray. My biggest tip when it comes to styling your hair in the humidity, though, is to go with your natural style. If you have straight hair, don’t try to add big bouncy curls expecting them to hold. If you have naturally curly or wavy hair, don’t bother flat-ironing. You can only rebel against the weather so much. Focus on rocking your natural style, just in a more polished way. To be honest, braided hairstyles will be your best friend if you get tired of trying to defy humidity. Especially with thick hair, the poofiness that comes with humidity is on another level. Braids help limit the amount of hair exposed, since sections are weaved over one another— especially french or dutch braids that sit close to the head. Other than that, topknots and sun hats will come in very handy! What are your favorite hair products for humidity and tips for when I’m on vacation? Leave them in the comments below! And now, for the best blog posts of the week from The Lipstick League. Prime Beauty – loves products that do double-duty and these stunning Sterling Silver Necklaces from Lilu Lip Caredo just that!